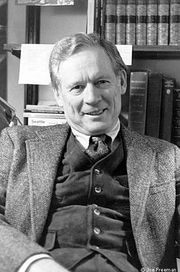 UW professor Hazard Adams is one of the foremost scholars of today in the fields of English romanticism and literary theory and criticism. He is also a UW alumnus with strong ties to the Northwest community. Adams received his Ph.D. from the UW in 1953. His father was headmaster at the Lakeside School in Seattle from 1934 to 1950. His mother, Mary Thurness Adams, served as assistant to the dean of Health Sciences at the UW and later worked as a UW research associate in biomedical history. After leaving the UW, Adams held a series of appointments at other universities, most notably at the University of California at Irvine from 1964 until 1977, when he joined the UW faculty. Adams currently is the Byron W. and Alice L. Lockwood Professor of Humanities in the comparative literature department at the UW. At Irvine, Adams was the founding chair of the English department, and later served as dean of the school of humanities and Vice Chancellor of Academic Affairs. Adams is one of the founding members of an international conference on humanistic discourse, originally funded by the Humboldt Foundation. Among Adams's numerous publications, his Critical Theory Since Plato is perhaps one of the most widely used and influential graduate texts in criticism and theory, notes Leroy Searle, director of the UW Center for the Humanities. "He is one of the top scholars in the world on William Butler Yeats, William Blake, and James Joyce, and he's just about the only academic I can think of whose twenty some odd books include scholarly studies, theoretical works, novels, and poems." Other publications include the books Blake and Yeats: The Contrary Vision; The Contexts of Poetry; The Horses of Instruction; The Interests of Criticism; and The Academic Tribes. Hazard Adams is currently considered a "single author." If one or more works are by a distinct, homonymous authors, go ahead and split the author. Hazard Adams is composed of 6 names. You can examine and separate out names.